The Columbia Gorge has witnessed some remarkable historical events. Several Native American tribes have lived along the river, many of them being present to greet Lewis and Clark when they passed through the Columbia Gorge in October, November, and December 1805, on their amazing expedition. Then later in the mid 19th century, line after line of covered wagons filled with hopeful families looking for a better life and some land they could call their own, covered the last stretch of the Oregon Trail through the Columbia Gorge. Slogging along rough, dusty dirt trails, or poling and floating down the Columbia River on log rafts, many of these hardy settlers would later build their homesteads along the Gorge, creating the towns that we now visit on our long weekends and vacations. Many historical societies in the Columbia Gorge have diligently restored old homesteads and cabins, preserving them as history and heritage museums crammed with thousands of historical artifacts that reflect the hardscrabble lives of those pioneers. More recently, three enormous modern museums have sprung up on the Washington and Oregon sides of the Columbia Gorge to reveal its rich bounty of historical, ecological, and natural treasures. Here are ten Columbia Gorge Museums of history and heritage for you to visit along the Columbia Gorge. Four of them are world class, while the others, although of more modest size, are no less enthusiastically operated by a caring staff and volunteers. Show an interest in any of the exhibits and artifacts, and they’ll talk your ears off and tell you some fascinating stories. And lest you think your kids will be bored with looking at a bunch of dusty old artifacts, think again. Most of these museums are kid friendly, providing all sorts of interactive exhibits and displays that will keep their interest for hours. Owned by the Skamania County Historical Society, this world-class museum opened in 1995, offering a marvelous portrayal of early cultural and natural life in the Columbia Gorge. Billing itself as “The Museum with a Heart, in the Heart of the Columbia Gorge”, this huge modern building, costing $10.5 million, is set on the north bank overlooking the Columbia River. With 23,000 square feet of space of which 11,000 are dedicated to exhibits, the CGICM is designed not to overwhelm the visitor with crowded galleries. The displays feature an eclectic variety of exhibits, the most spectacular of which is the cavernous main gallery with an interesting juxtaposition of four enormous, eye-catching machines that simply leaves you in awe. The 37 foot-high McCord fish wheel replica is a funky looking contraption used to harvest Salmon from the Columbia River. Introduced in 1879 at fast waterways, there were 76 of these ingenious devices on the Columbia River by 1899. The wire mesh wheels used water power to scoop up from 4 to 8 percent of the annual Salmon harvest and deposited them into large boxes. The Gillnetters lobbied congress to get them outlawed, claiming that the fish wheels were depleting the Salmon runs. The Gillnetter lobby was so large that congress believed them and thus they were banned in 1926 in Oregon, and in 1934 in Washington. Standing high up on the rocky wall overlooking the fish wheel stands a native Indian, fishing for Salmon with a dip net at the end of a long pole, a sharp and powerful contrast to the mechanical fish wheel below. Alongside the fishing wheel is an immaculately restored bright yellow 1921 Mack Logging Truck, stacked high with three enormous cedar logs. Overhead flies a beautifully restored, green painted, 1917 Curtiss JN-4 (Jenny). These early aircraft, sentimental favorites among aviation aficionados, were the first mass produced warplane in the United States. With a top airspeed of only 55 mph, and a stall speed of 35 mph, there wasn’t much room for error, and the pilots often ended up walking back to base after they crashed the “Jenny”. About 17,000 JN-4 Curtisses were built—this one was found in pieces in Spokane, restored by Wally Olson, and is on loan to the museum by the Olson family. Only seven airworthy Curtiss Jennys exist today, making this quite a rarity. Interestingly, another restored, airworthy Curtiss Jenny can be found in the WAAAM Museum further up the Columbia Gorge at Hood River—but more about that later. Adjacent to the Mack Logging Truck is another interesting piece of early technology, a 32-ton Corliss Steam Engine. Built well before 1900, this behemoth provided power to a sawmill at Tenino, Washington, then later in Hemlock, Washington, for the Wind River Logging company. It powered the saws; saw carriages, and conveyors at the mill. During World War II this engine powered the cutting of timbers (called “China cants”) from 12” to 24” thick, and 6 to 7 feet wide, that provided the decking for baby flattop aircraft carriers. It’s an impressive looking machine, and could generate 400 horsepower, with a 16-foot flywheel weighing 15 tons. Upstairs, the Formation Theater shows a 20-minute presentation describing the cataclysmic events that formed the Columbia Gorge over the past 15,000 years. Next floor is a well-constructed facade of an early house, built into the museum wall. Inside, television monitors tell you about the daily lives of teachers, loggers, fishermen, geologists, and newspaper editor. It appears that far higher moral standards were required of teachers back in the day, than are required today. For example, “after ten hours in school, the teacher may spend the remaining time reading the Bible; women teachers who marry or engage in unseemly conduct will be dismissed; men teachers may take one evening a week for courting purposes or two evenings if they go to church; and any teacher who smokes, uses liquor in any form, frequents pool or public halls, or gets shaved in a barber shop will give good reason to suspect his worth, intention, and honesty”! There’s a real surprise a little further on in the Spiritual Quest Gallery—the world’s largest collection of rosaries donated by a Catholic convert named Don Brown, who later became a member of the Third Order of the Dominican Brothers. The Rosary and religious artifact collection is huge—around 4,000 rosaries, as well as other religious objects from the Pacific Northwest. The rosaries are made from all manner of materials—bone, semiprecious stones, nuts, deer antlers, Ping-Pong balls, to name a few. The First People gallery tells of trading in the Columbia Gorge between the Klickitat, Wasco, Wishram, Yakama, and other Indian tribes that lived here. You’ll see early American Indian and pioneer artifacts—baskets, bowls, and blankets. Other exhibits tell about Lewis and Clark’s expedition, and their visit to the Clahclehlah Indian village. At various points around the museum you’ll see realistic fabricated rock walls molded from the basalt cliffs that are found along the Columbia Gorge. Look for the perfectly restored 1929 Ford Model “A” Coupe STD tucked away in the museum. Before you leave be sure to check out the museum store, well stocked with books and souvenirs. Outside, the kids can explore the 1956 Spokane, Portland & Seattle diesel train engine. This engine plied the line connecting Portland, Seattle and the railroads east, opening in 1908. This engine was retired in 1998 and donated to the museum a year later by Burlington Northern-Santa Fe. Hours: Open daily, 10 a.m. to 5 p.m. except for New Year’s Day, Thanksgiving and Christmas. Directions: The CGIC Museum is located 45 minutes east of Portland, Oregon. From Interstate 84, take the bridge at Cascade Locks over the Columbia River to Washington Highway 14, then head east towards Stevenson. Look for the access road to Skamania Lodge and the Columbia Gorge Interpretive Center Museum on the north side of the road. This regional interpretive center for the Columbia Gorge National Scenic Area is another world-class museum that easily rivals its counterpart across the river in Stevenson, and thus well worth visiting. It offers a magnificent view across the Columbia Gorge, the river, and the surrounding scrublands that have been set up as a habitat for turtles, ducks, geese, eagles, raccoons, and songbirds. An interpretive trail meanders through cottonwoods, willows, cattails, sedges and wildflowers in season. Take some time to look through the rusting ploughs, restored wagon and old shacks, scattered around the grounds. Two museums complement each other under one roof here, both with stunning exhibits, so allow plenty of time to explore them. You’ll learn about 40 million years of natural history and 10,000 years of human cultural history of the area, through displays, films, recordings, and some highly creative models and backdrops. The 17,200 square foot, professionally designed Wasco County Historical Museum walks you through galleries about early Wasco County on Native People, Missionaries, Agriculture, the Military, and Firearms. But the show stealer is an atmospheric street scene based on The Dalles, that walks you back in time to the 19th and early 20th centuries past the bright red painted Seufert Brothers Salmon Cannery, shop fronts, a Umatilla house, a Rail depot, and a viewpoint of the Oneonta Side Wheeler. The remarkable backdrop paintings create a highly authentic ambiance. Next door, inside the Ernest A. Kuck Wing, you’ll find an interesting display all about the cargo, equipment, and supplies used by the 33 intrepid explorers on the Lewis and Clark expedition, Lasting from May 1804, to September 1806, the expedition required a lot of supplies—30 tons in all. Carried in crates, boxes, and barrels the equipment consisted of gifts for trading with the natives along the way, while the remainder was arms, medicines, clothing, mathematical instruments, camp equipment and provisions, and transportation. You’ll see a wagon piled high with supplies and a pitched tent depicting typical expedition scenes. For the kids, the Explorer Room offers hands-on learning for children of all ages. There’s an archaeological dig, a keelboat model where you have to balance the load to prevent capsizing, clothing to try on, puzzles, etc. Now for another great surprise in this superb museum. Cross the central hall and enter the Ice Age Exhibit in the 26,100 square foot Columbia Gorge Discovery Center. You’ve got to love a museum where you’re greeted by a massive, 13-foot tall Colombian mammoth! Looking somewhat like an elephant, this beast towers over you, its 13-foot tusks stabbing the air menacingly. The Colombian Mammoth lived in this region until it became extinct about 10,000 years B.C. After you recover from this incredible sight, continue through to the galleries on Native Living, Gorge Geology and Ecology, Lewis and Clark, Fur Trappers and Traders, the Oregon Trail, Transportation, and Recreation and Industry. The Oregon Trail has a memorable life size recreation of a family floating their covered wagon down the Columbia River on a log raft. The Discovery Center offers 26,000 objects for display. In the hallway between the two museums you can admire a gorgeous view of the green hillsides of the Columbia Gorge across the river. There’s also an excellent museum store, packed with a huge range of tempting history books on all things Northwest, and other souvenirs. Hours: Open Daily from 9 to 5, except for New Year’s Day, Thanksgiving and Christmas. Directions: Take I-84 to Exit 82, right on Historic Columbia River Highway (Hwy 30), follow for 1.5 miles, right on Discovery Drive, follow signs to site. The Columbia Gorge has yet another world-class museum, this time showing off very rare aircraft and automobiles. Tucked away on the back stretches of the bustling little town of Hood River, this vast new 90,000 square foot museum proudly displays over 60 perfectly restored historical aircraft and dozens of classic automobiles. Open in September 2007, the museum’s collection of 60 antique prop aircraft, the world’s largest, starts with an original 1917 Curtiss JN4D Jenny. Aviation history is mirrored through other rarities like the 1937 Aeronca LC, a 1928 American Eagle, and a 1931 Curtiss Wright 12-W. The museum also boasts one of the world’s largest collections of flying 3 cylinder radial engine aircraft and of flying OX-5 Aircraft. With most of its aircraft dating between 1917 and the end of World War Two, WAAAM provides a fascinating tour through the history of early aviation. There’s no shortage of World War Two aircraft and vehicles either. The museum’s unique and pristine collection of American military training, liaison and reconnaissance aircraft is the most comprehensive in the U.S.A. Among them are a 1940 N3N Seaplane, a 1941 PT-22, a 1942 Piper L-4-A, a 1942 Aeronca L-3, a 1943 Taylorcraft L-2M, and a 1942 Stinson L-5. The collection of fully restored and operational military jeeps includes a 1943 WWII GPW with 50 cal machine gun; a 1942 M100 Utility combat trailer; a 1949 M100 Utility/Combat Trailer; a 1952 M38 Korean War era with 30 cal machine gun; and a 1952 M38-A1 with mounted 106 mm Recoilless Rifle. A number of World War II weapons are exhibited in glass cases. The classic and antique automobile collection includes a 1914 Model T Ford, a 1923 Henderson Model K Deluxe Motorcycle, an 1899 Locomile Steam Car, a 1931 Model A Sedan, a 1949 Indian Silver Arrow, a 1936 Plymouth 2 door Coupe F6, a Mercury 4 door Limited Soft Top V8, and a 1957 Studebaker Golden Hawk 289 Paxton SC—some amazing sights that remind you of cruising in the old movies. If you have even the slightest interest in vintage cars and planes, this Coumbia Gorge museum is a must see. Directions: WAAAM is located 3 miles south of I 84 in Hood River. From exit 62 take an immediate turn onto County Club. Turn left on Barrett and go through 4-way intersection, then head right onto Air Museum Rd. The History Museum of Hood River County has been a part of the Columbia Gorge community for over 50 years. The volunteers here are excited about their displays and the museum is packed with over 12,000 interesting artifacts and dioramas of early life in Hood River County. Many of the exhibits depict the region’s early dependence on lumber and fruit. You will definitely want to plan your visit for April, May and June of 2010 as the museum will be hosting a wonderful exhibit entitled Farm Life: A Century of Change for Farm Families and Their Neighbors. This exhibit is coming to Oregon from the National Endowment for the Humanities and can only be seen in Hood River. But don’t despair if your travels take you to The History Museum after June 18th, since the museum has an extensive collection of farming and agriculture artifacts that will be on exhibit until October of 2011. You’ll see all sorts of paraphernalia about apple production, fruit box labels, an apple polisher, tools for making apple boxes, interesting agricultural photographs … and much, much more. The collection at The History Museum is varied enough to keep your attention for an hour or more, with early pioneer artifacts and beautiful Native American baskets and beaded bags as well as items reflecting the ethnic cultures that helped form the communities of Hood River County. Check out their website for details on special programs and events relating to Farm Life. The historians of this Columbia Gorge museum have collected 6,000 historic photographs and 200 oral histories from Camas and Washougal, plus Native American artifacts, Chinook baskets, and stone tools uncovered from archeological digs in the area. You’ll spend an hour or so wandering around household furniture, kitchen utensils, glassware, farm tools, books, clothing, historic photos, art, antiques, toys, dolls and other memorabilia from Washougal’s past. Hours: Open Tuesday through Saturday, 11 a.m.-3 p.m. Directions: Located just north of the Lewis and Clark Highway, across from the Pendleton Woolen Mills in Washougal. Sponsored by the West Klickitat Historical Society this impressive collection of artifacts from the western part of the Columbia Gorge is displayed in the former Bingen Congregational Church (1912). Artifacts come from a variety of early settlers: explorers, trappers, ranchers, miners, and loggers, and include logging and farming tools, medical and surgical equipment, gloves, and a blacksmith’s forge. You’ll get a good idea of how the early settlers lived from their pioneer clothing, kitchen wares, toys, military items, Native American artifacts, and a post office display and a replica country store filled with medicine bottles, jars, containers of foodstuffs, and household implements. Historic photos show some fascinating scenes of early residents, sawmills, buildings, streets, and American Indians fishing at Celilo Falls. Directions: From State Highway 14 9Steuben Street) turn north on maple and go one block to Humboldt Sty. Museum is on N.E. corner. Situated in one of the three original locks tender’s houses (1905), in the Port of Cascade Locks Marine Park, the museum features photos and artifacts about the history of the Columbia Gorge, especially the construction of the Cascade Locks, and the tools that were used to build them. The history of the Cascade locks is told in the three-story museum that overlooks the original locks, and now a National Historic Site. In 1805, Lewis and Clark’s Corps of Discovery had to portage their equipment and supplies around the whitewater rapids and cascades at this part of the river. Likewise, the pioneers traveling the water route of the Oregon Trail 40 years later, had to do the same thing. The Government Locks and Canal around the Cascade Rapids were constructed between 1878 and 1898, quite an engineering feat for the time. The locks were 460 feet long, with 55 feet high and 52.5 feet wide steel gates. Operating completely by waterpower, both chambers of the locks could be filled or emptied in ten minutes. As with much technology of that era, the locks became obsolete when the Bonneville Dam was built in 1937. Today you can still see the structure and hand-hewn masonry of the original Locks just below the museum. You’ll also see displays about logging and Sawmills, fishing and fishwheels, Native Americans, Railroads, Sternwheelers and Steamboats that ran on the river, early river navigation, and schools. There’s a herd of taxidermied animals and a large replica of a fishwheel. Next door in an exhibition chamber is the Oregon pony steam locomotive, which started work in the Oregon territory in1862, the first to be used here. This workhorse moved 200 tons of cargo a day between the Cascades and Bonneville. Hours: Open May through September, 12 p.m. to 5 p.m. Directions: Located 45 minutes from Portland, Oregon on I-84, directly across from Stevenson, Washington. Take Exit 44 from I-84 into Cascade Locks. The entrance to marine Park is on the river side of the main street that goes through town and back onto the freeway. Established in 1906, this Columbia Gorge museum is the oldest history museum in Oregon, preserving the legacy of the former military base named Camp Drum, established in 1850, then renamed Fort Dalles in 1853. By 1868 the fort was no longer needed. The wooden Gothic style Surgeon’s Quarters, the Fort’s sole surviving building, was built in 1856, and is a National Historic Landmark. Now a museum, it houses many interesting artifacts for you to ponder ranging from carpentry tools, weapons, historic photographs, and Native American artifacts like arrowheads, and stone tools. There’s a plethora of 19th century pioneer and military memorabilia from including irons, blackened kettles, bottles, lanterns, locks, keys, pianos, books, clothing, sewing machines, spinning wheels, maps, model steamboats, cavalry swords, saddles, rifles, bullets, powder horns, and holsters. The enthusiastic and knowledgeable docents will be happy to guide you around. In two separate building are superb collections of antique automobiles with a rare1904 Studebaker Electric car, and horse-drawn wagons including U.S. mail carriers, a hearse, a lumber cart, delivery wagons, and a Surrey carriage. Nearby is the Anderson House, also a National Historic Landmark, a hand-hewn log homestead built by Swedish immigrants to Wasco County in 1895, and relocated to The Dalles in the 1970’s. Hours: Open April to September, Daily 10 a.m. to 5 p.m.
October to March, Thursday to Monday, 10 a.m. to 4 p.m. Directions: From I-84 take Exit 85 (City Center) onto Second Street. Turn left onto Union Street and right onto W 15th Street. The museum is on the corner of W 15th and Garrison Streets. Northwest entrepreneur, attorney and road building advocate Samuel Hill purchased 5,300 acres of land along the Columbia River for a Quaker farming colony, but it was never developed. Visitors to the Gorge owe Samuel Hill a large debt—it was he who proposed the Columbia Gorge Highway, “So the world can realize the magnificence and grandeur of the Columbia Gorge”. In 1914, he started construction of a castle-like chateau (now on the National Register of Historic Places) overlooking the Columbia Gorge. The house remained unfinished in 1926, when Queen Marie of Romania, a friend of Samuel Hill’s, dedicated the unfinished house as a museum at a ceremony with over 2,000 people attending. After Hill’s death in 1931, sugar heiress Alma Spreckels had the finishing touches put on the fine arts museum, opening it in 1940. Lovers of decorative and fine arts will find an interesting and diverse collection of artifacts, artwork, and sculpture here: American classical realist paintings, paintings by American, British, Dutch and French masters, Russian Orthodox icons, 100 decorative chess sets, art nouveau glass, and miniature French fashion mannequins created by Parisian costume houses after World War II. Donations by Queen Marie of Romania include ball gowns; furniture, jewels and other heirlooms are displayed. The Native American artifacts collection features 1,000 baskets, beadwork, and rock carvings. But the museum’s centerpiece is the gallery of 87 large sculptures and watercolors by Auguste Rodin, the father of modern sculpture. You’ll see bronzes, terra cottas; plaster studies and watercolor sketches by Rodin here. The Rodin sculptures include well-known works like The Thinker, The Hand of God, The Age of Bronze, and a life-size plaster of Eve from The Gates of Hell. You can stroll around the Museum’s 23 acres of beautifully landscaped grounds amid roaming peacocks, or watch a summertime concert. Hours: Open 7 days a week, including all holidays, from 9 a.m. to 5 p.m., March 15 through November 15. 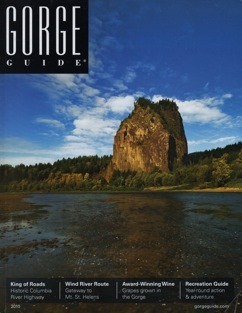 Directions: Located 100 miles east of Portland on Washington Highway 14. From Interstate 84 take Biggs Junction Exit, and then go north on Hway 97 to Washington Highway 14, and west for three miles. This Columbia Gorge museum is housed in what must be one of the most beautiful buildings in the State, Presby Mansion (1902), now and a National Historic Landmark. The 20-room Victorian mansion formerly owned by Winthrop Presby, former mayor of Goldendale, has three floors of furniture, clothing, utensils, camera equipment, 124 coffee grinders, a pump organ, children’s toys, Indian crafts and tools, branding irons, and personal effects from the 1880s to the 1930s. The attic is decorated like an authentic homestead cabin. A carriage house on the Museum grounds displays antique farm machinery, and there’s a turn of the century one-room school. This makes an excellent side trip for when you visit the Maryhill Museum of Art in the Columbia Gorge. Directions: From Highway 97, turn west on State Route 142. Follow State Route 142 to Goldendale. The museum is on the corner of W Broadway and Grant Ave.